I fashioned some letters and scattered them around, mixing them up, planning on making an "I Love You" quilt. Never got that far. 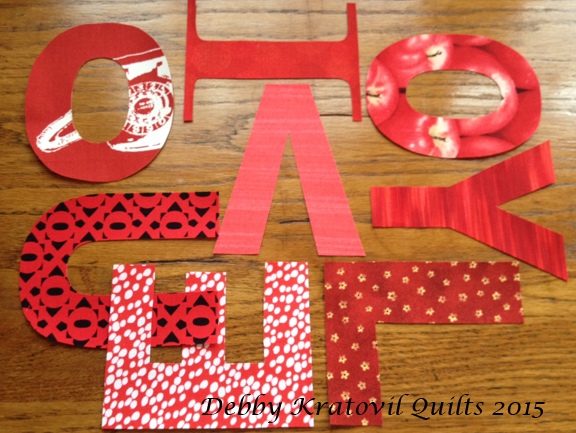 Each letter is appliqued to a rectangle of white fabric cut to 5-1/2" x 7-1/2". Then the four are stitched together as shown. 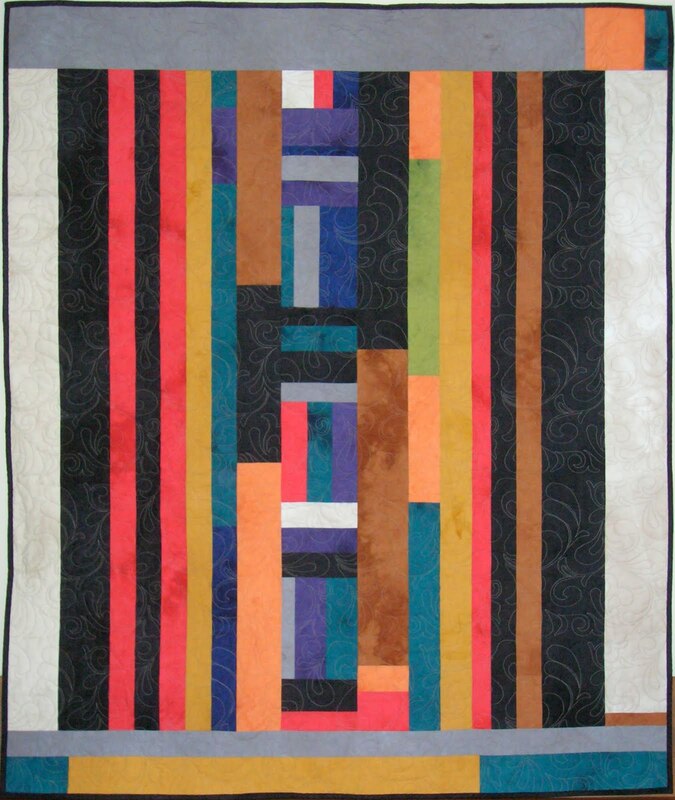 The outer 3-strip borders are composed of three 1-1/2" strips AND corner squares cut to 5" (so they finish to 4-1/2"). The small wall quilt measures 19" x 23". Here is the link to the full size letters. Why not get a jump on Valentine's Day 2016? Actually, I loved seeing it hanging in my kitchen when I was photographing it, so I've left it there. Kitchens are places of love, aren't they? 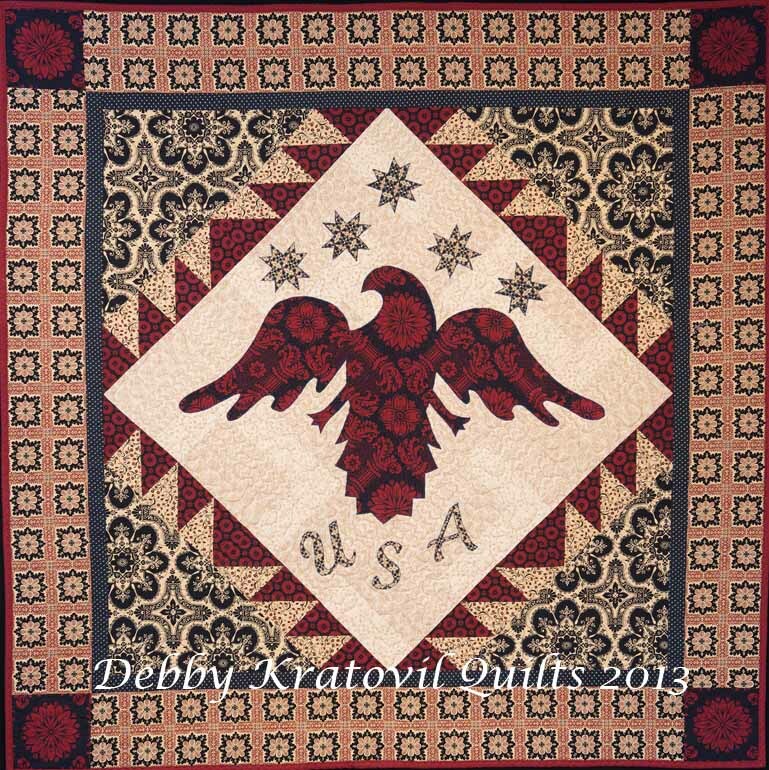 I was working on my USA series of paper pieced states on Sunday and came to South Carolina. I stopped and thought, "Wow! 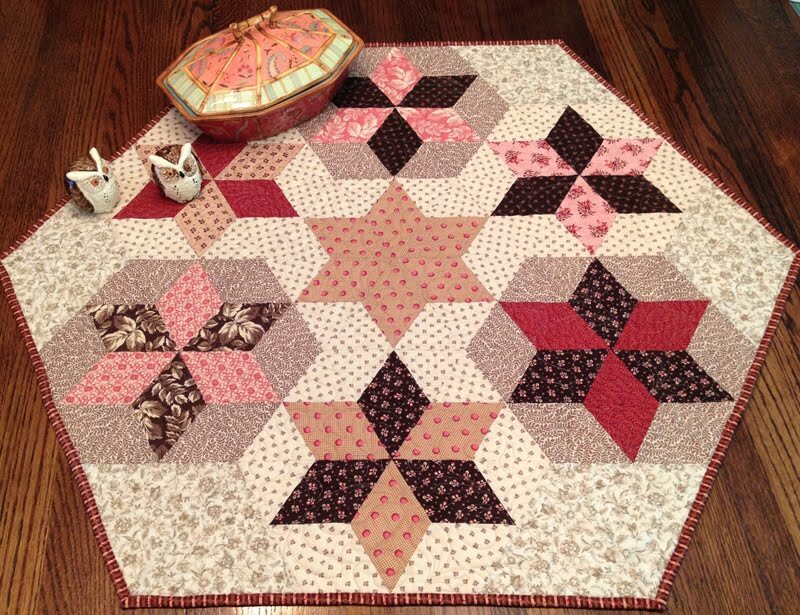 I need to sew this in honor of those who lost their lives." I wanted fabrics that read solid with a rich, deep color. Beautiful colors, but not dancing brights like I typically choose. Here is my South Carolina Star. 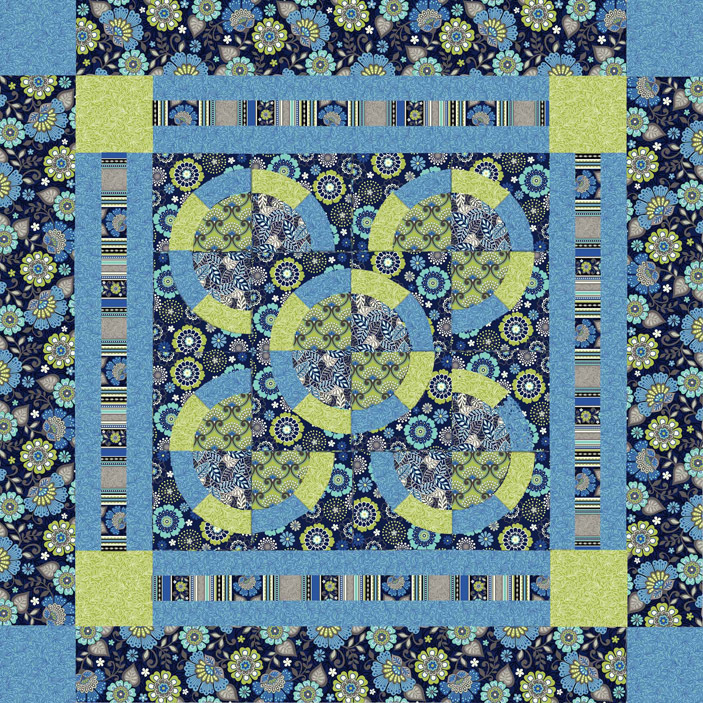 I finally had a project for the Artisan Cottons by Windham Fabrics. The shot cottons are a beautiful array of colors, don't you think? Can you see the red warp thread in the purple fabric below? These are special cottons with two different colors of thread used in the weaving process. I love shot cottons. 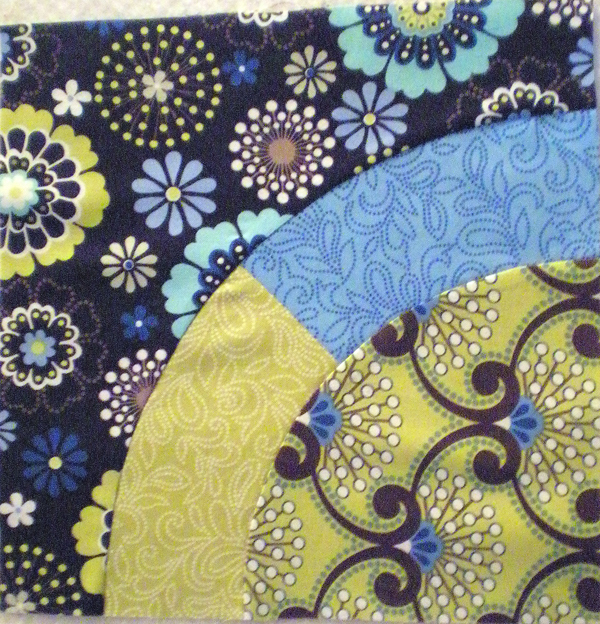 Here is the block by itself, made with these fabrics and a standard white background. I hope this block helps us remember that life is about putting things together and not ripping them apart. This is a PAPER PIECED pattern for a 12" block. 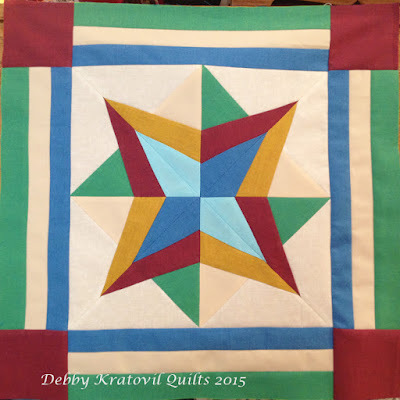 You can have the FREE pattern: South Carolina Star. If you look closely at those points and odd shaped patches, if you want to convert this to templates - be my guest! Paper piecing gives me accuracy every time. 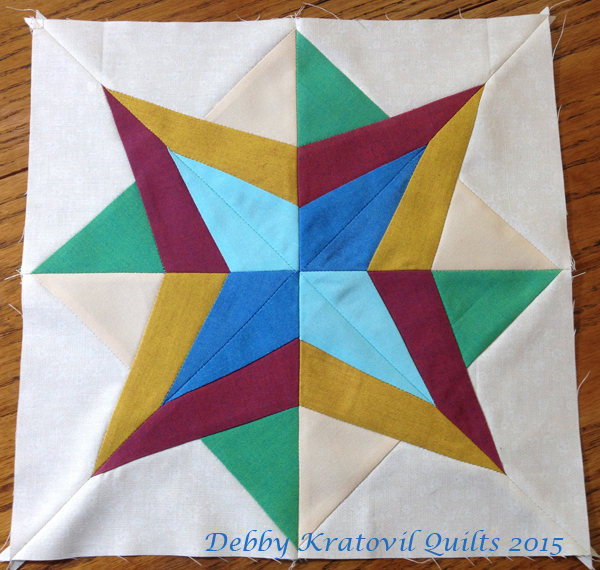 And now I take my quilter's hat off for a minute to reflect on the colors and how they relate to the 9 Christian martyrs who were slain in Charleston last week. They were regular people using their free time to worship God in a church, usually thought of as a safe place. BLUE is for their faith in God, both weak (light blue) and strong (dark blue). They were human! GREEN is for eternal life, which is what they have now. RED is the color assigned to martyrs, slain in innocence through no fault of their own. CREAM is for the tears we all have shed at such a loss. GOLD is for the crowns they now wear in heaven. This is my take on it. I'm not looking for any religious discussions, though you're free to respond as you wish to what I've said. 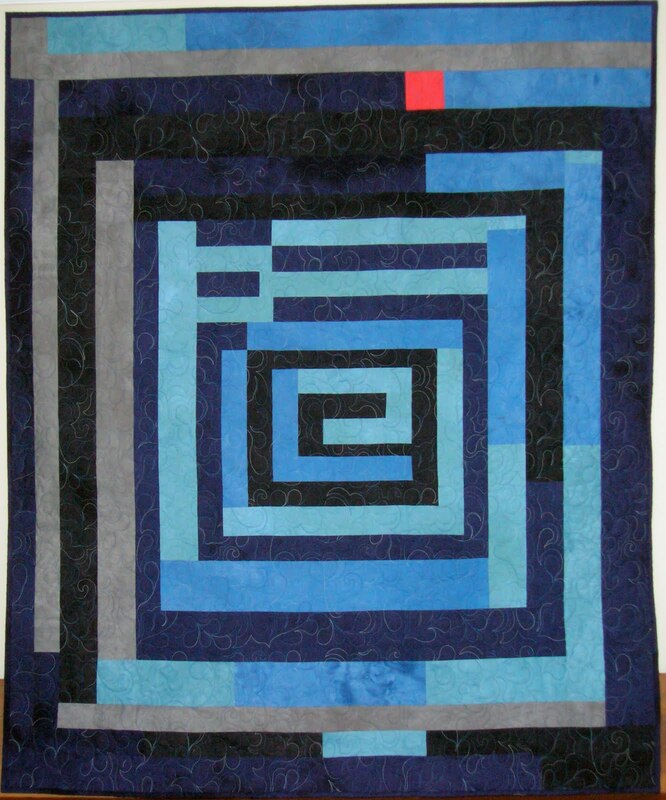 My blog is 99% of the time only quilts. 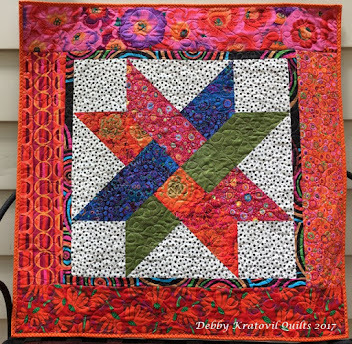 All quilts. All the time. But this horrific event has so profoundly moved me, and the response of that Christian community in Charleston is beyond anything I could ever imagine. I just wanted to honor those who live worthy lives, and in death, those left behind offer an agonizing dignity that we should all hope to aspire to. I hope you'll try your hand at the South Carolina Star. May it brighten your day! 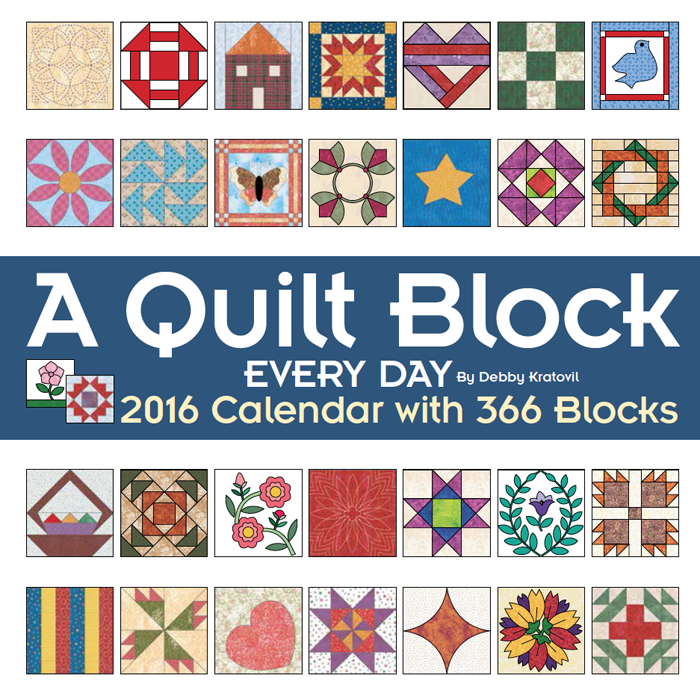 2016 Wall Calendar of Quilt Blocks Has Arrived! I'm so excited. The newest of my calendars has arrived and I received my author shipment a few days ago. I've been creating these calendars since 2006, but I am still thrilled to get one right off the presses. 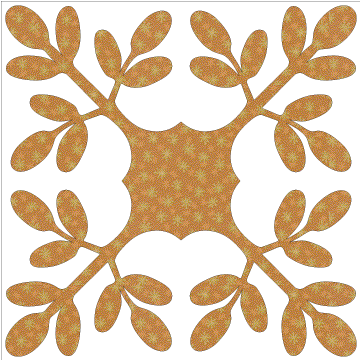 This calendar is different in that there are no patterns (GASP!) 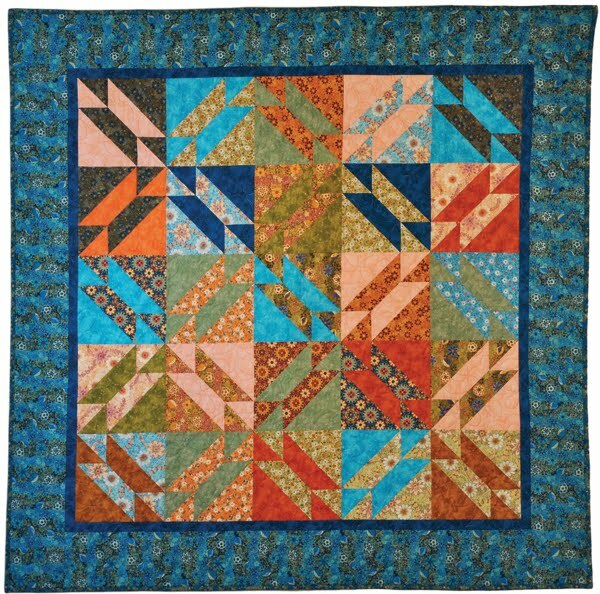 Just a picture of a quilt block every single day for all of 2016. I plan on sharing what I've termed "Blocks of the Moment" as often as I can. 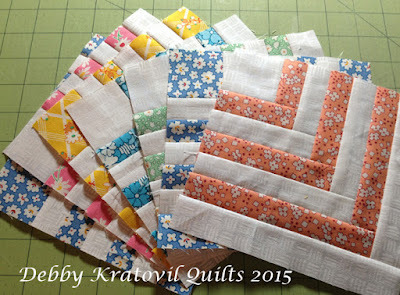 That means that I will be sharing the PATTERNS for some of these blocks as we head into the Summer and Fall. I want you to go looking for it! 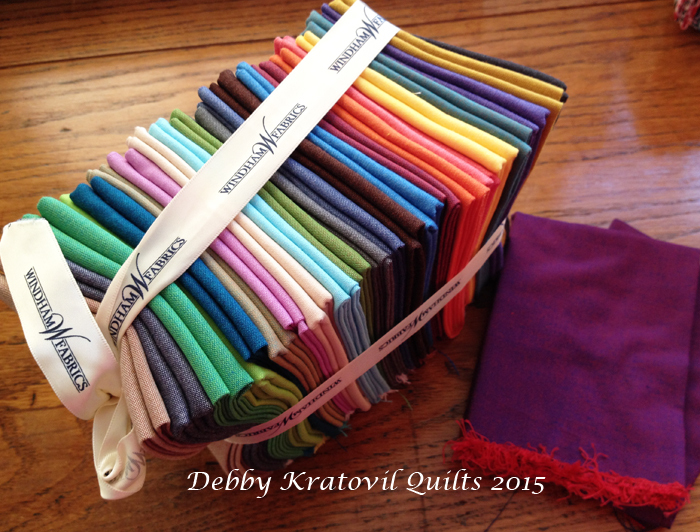 Ask your local quilt shop to carry it (I just arranged with Checker Distributors to carry it). What patterns do I have in mind? How about one of the Laurel Wreath birds? Laurel Wreath blocks are 12" x 12"
Or perhaps a Hawaiian applique block, 14" square (with full size template)? And one of my favorites - LOVE Letters. I've already made a small wall hanging with those letters I made back in February. Do you remember these? 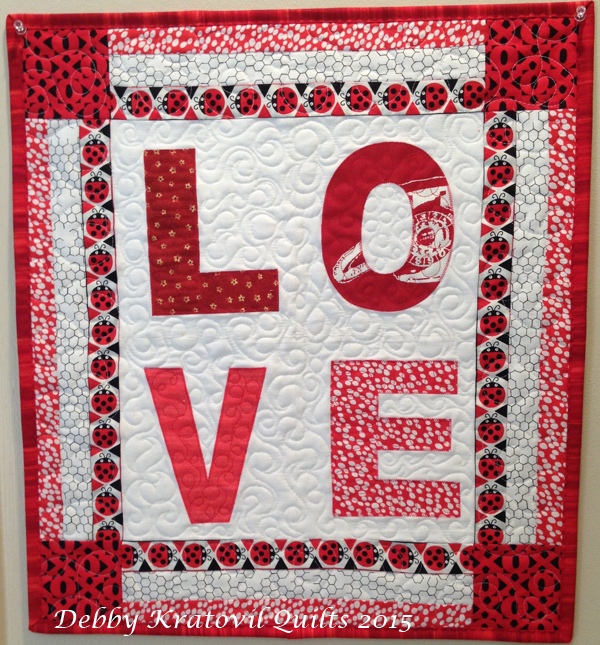 I used these glorious Benartex red fabrics and made the banner using my pattern from the 2007 calendar. Do you see those cute little bugs at the top? 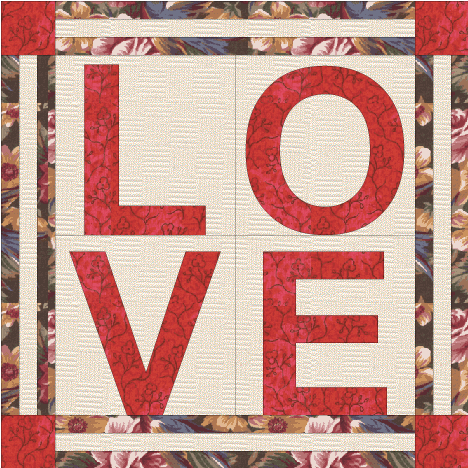 I use them in the block sashing and so I call the block LOVE Bugs. Can't wait to show it to you (and give you the FREE pattern). Stay tuned. The LOVE banner will be first and will be soon! That's all I'm saying. 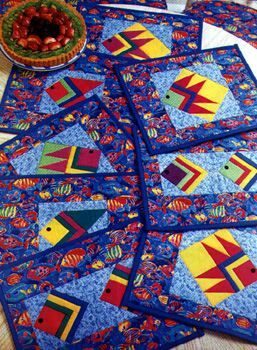 I received a request from someone (Judy) yesterday wanting to know about my Fish Placemats from 1996. Do the math: that's almost 20 years ago. Yikes! They appeared in Quick Quilts Magazine and I've used these blocks in various calendars over the years. I have been online since 1993, with a web presence since 1997. I created a HUGE "lessons" page and I think Judy must have happened on that treasure trove. Would you like the link? A little later - be patient! Here are the 3 fish patterns I have in this very old lesson: Algernon the Angelfish, Thomas the Tuna, and Marvin the Mullet. Aren't they cute? I have not updated the files. It is an old html page, but all the info for making the placemats and paper piecing the fish is there. It's sort of a blast from the past, but everything is in color and there are two links for constructing the fish and placemats. You can order my By the Sea Collection of paper pieced fish and boats (15 patterns in two sizes), which comes with over 100 MORE paper pieced blocks in the 117 Paper Piecing Patterns CD. 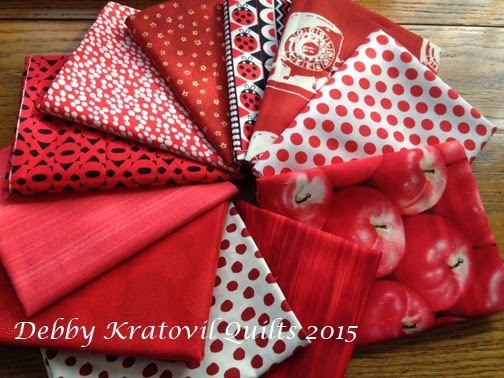 The correct price is $12 for the 117 patterns (on the order form). But, the above 3 fish patterns are FREE to everyone. International shipping is extra, so check with me first before ordering. And you can order the CD via PayPal, also. I am tempted to make these again. They were so much fun to make and I hope you'll enjoy making them, too. 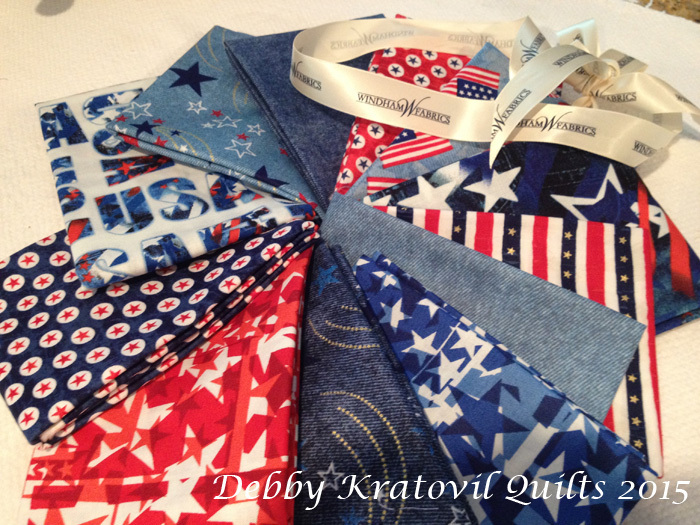 I have a soft spot for patriotic fabrics and keep them all together in my stash. 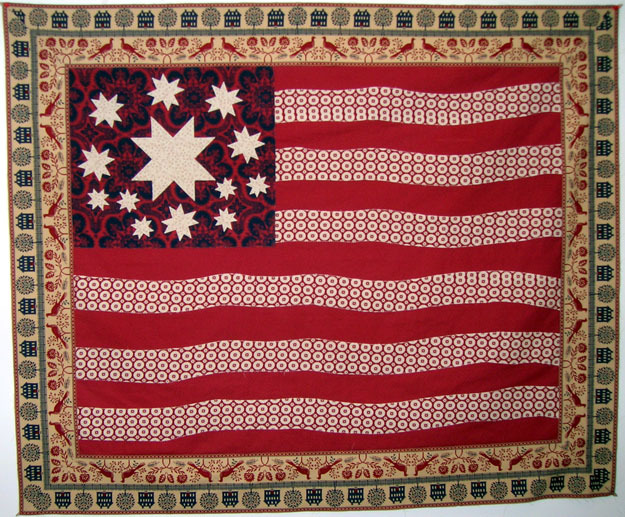 Here is a new one from Windham Fabrics titled simply "USA." With denim backgrounds and plenty of stars and stripes, this is a grouping that works well for those fabulous Quilts of Valor many are making. I think it will be fun to see what the two of us come up with. 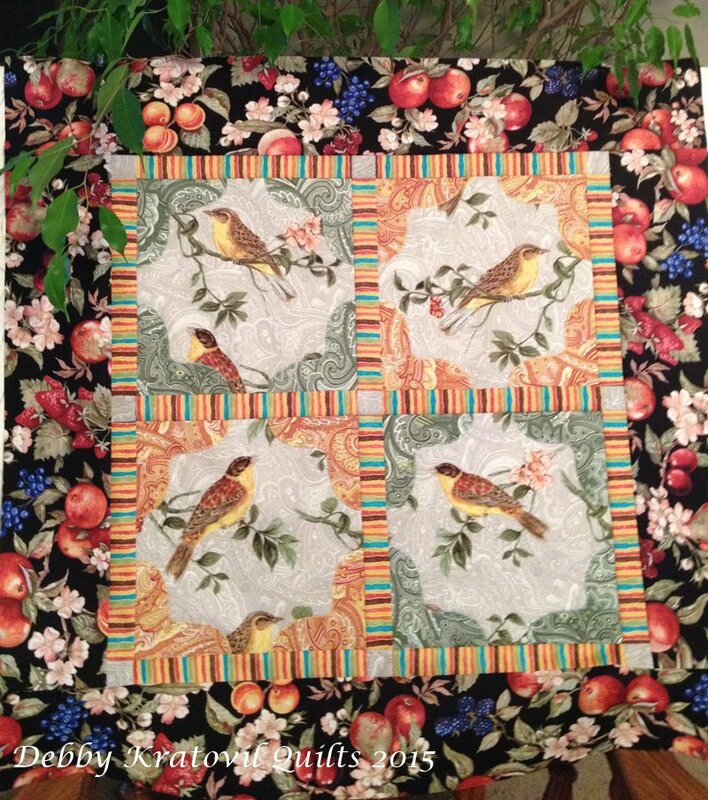 Jeannine does not sew for a living and makes things other than quilts with her fabric. Me? I always think "blocks" and "quilts." 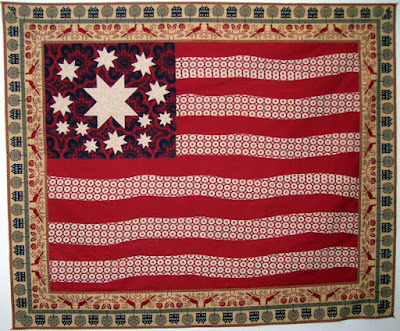 If you'd like some Americana and patriotic quilt inspiration, please visit all the Star Spangled Banner posts I shared last September (this link is for the winners of the fabrics and gives links to all 7 of the days with free patterns). Or maybe this one . . .
Stay tuned for my reveal of the four 18" blocks made with the new USA Collection. Over the weekend I realized I have one more quilt using the donut shape (to carry National Donut Day a little longer). 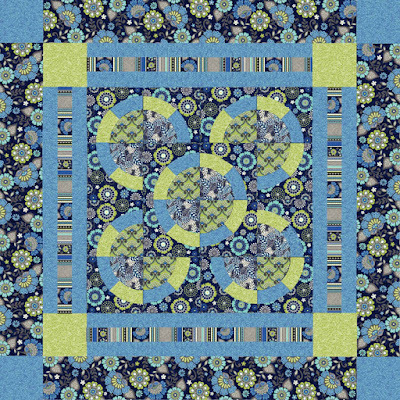 I call it Ezekiel's Wheel and it was designed for Windham Fabrics using their Moonstruck Collection. 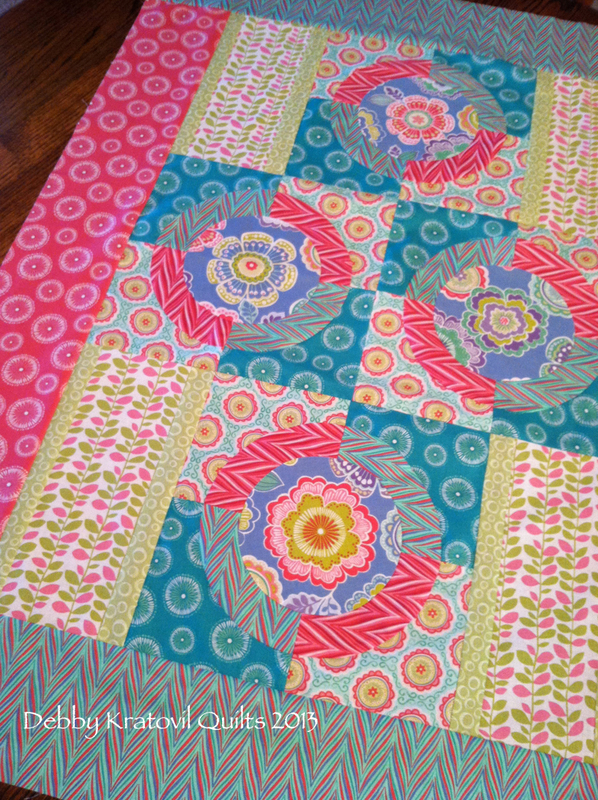 I actually made the entire quilt which is yet to be quilted. Don't you just love that lime green! Ezekiel's Wheel: 62" x 62"
Can you see how 4 blocks can give the illusion of 5 blocks when part of the block is turned 90 degrees? The center "block" is actually composed of one unit from each of the 4 real blocks. 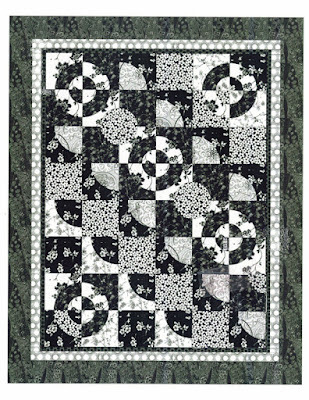 I have made about a dozen quilts using this illusion and I love it. 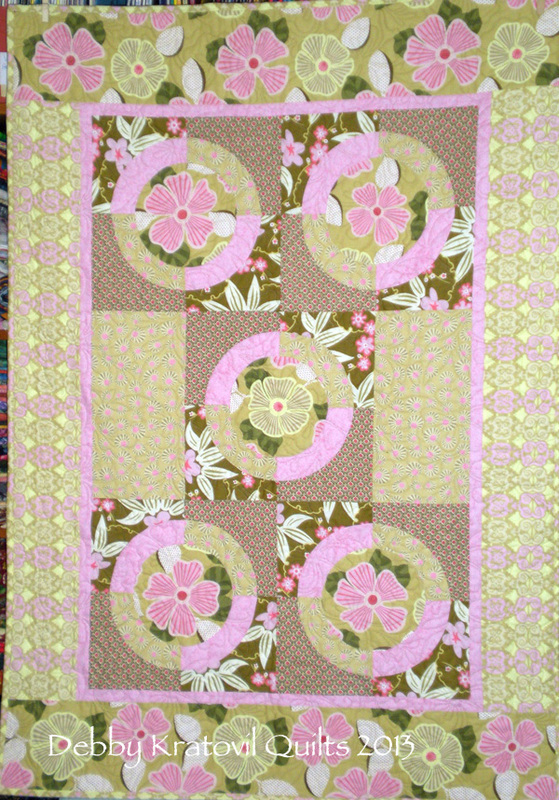 You can see the tutorial for sewing the block here and the pattern is also available with full size templates. The 18" blocks (there are four of them) are made of four 9"units with that donut shape. I somehow got through the weekend without eating a single donut. I didn't say I didn't eat any yummy dessert, though. My daughter brought me a piece of "to die for" chocolate mousse cake from the restaurant she and her husband ate dinner at on Friday night. Compensation for babysitting the little grandsons overnight so they could get away. I'll take chocolate cake any day! And calorie free donuts. I love them but can't eat them like I used to. Can't burn those calories, but there are times I give in and have a powdered sugar coated jelly doughnut. Yum, yum! How about a calorie free fabric doughnut? You can have as many as you like. 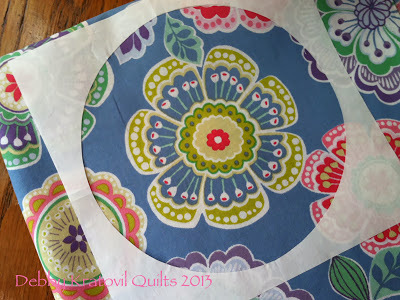 Today I'm reposting about three quilts and giving the free pattern for the block so you can try your hand at these doughnut shaped fabric patches. 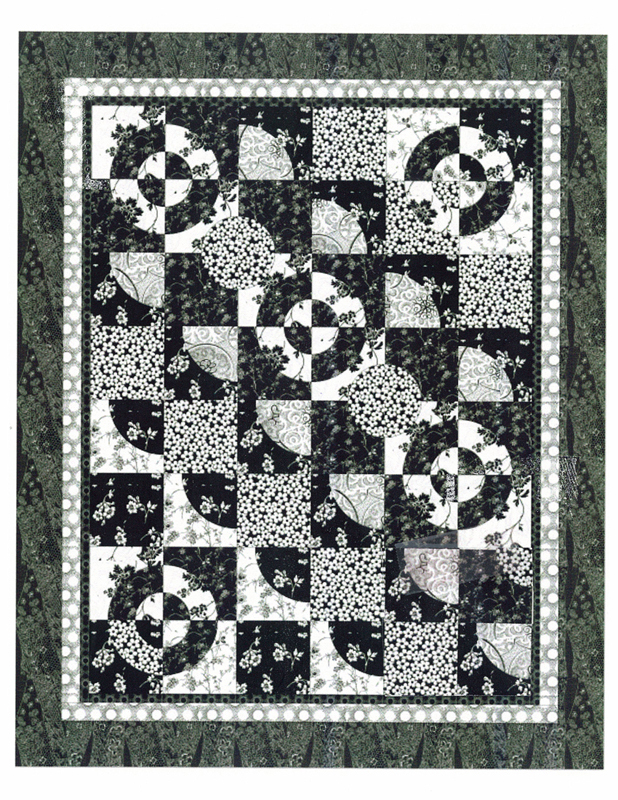 Ebony & Ivory: 54" x 66"
The blocks are 12" and the alternate patches and half-units finish at 6". 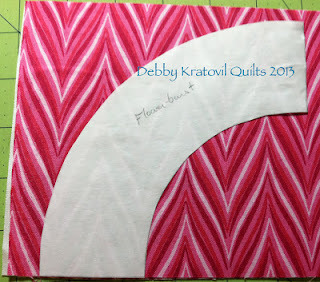 The curves are raw edge appliqued. If you still have the Spring 2012 issue, the pattern is there. Then I turned it into a 5 block quilt thinking Quiltmaker would like to publish it. Pink slip! I returned to it one more time for a picture tutorial using another Benartex set of fabrics, the Dori Collection. 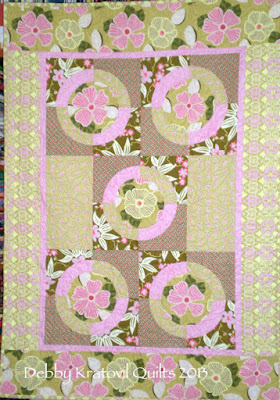 It was featured on the Benartex blog (SewInLoveWithFabric) on a Technique Tuesday: Curves and Circles. If you click that link, you will see my steps, in pictures, of how to cut and stitch the block. 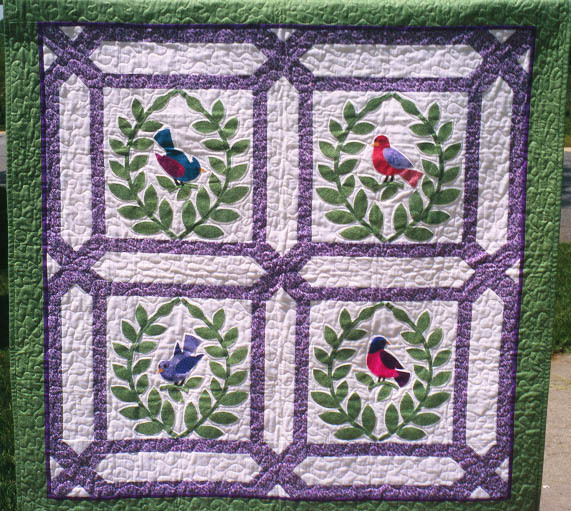 The center circle is fussy cut, interfaced and then appliqued over the center. You could call it a doughnut hole, right? Don't forget to celebrate National Doughnut Day (June 5) today! And if you eat a real doughnut, think of me! 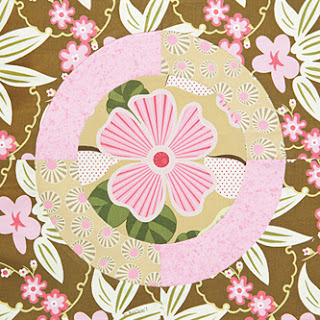 Today is Wednesday and if I have any new Windham Fabrics, I like to feature them on this day. I like the alliteration of "Windham Wednesdays," don't you? (That's me wearing my high school English teacher hat, I guess). This collection is called Stella and is designed for Windham by Lotta Jansdotter. I love all of her fabrics and so do my two married daughters. They are in their 30s and when they say they love fabrics in my stash, then I know it's a home run for those fabrics in the shops. I have pondered what to do with these for the past few weeks. I wasn't in a hurry since they weren't available for shops to buy until May and won't ship to the stores until August. But, May is over and August is right around the corner! I designed a larger block with 2 different sized logs. You'll have to come back next Wednesday to see what I've done and the variety of ways to arrange them. Quite exciting! And the pattern will be free and it's very fat-quarter-bundle friendly. I mean - don't you have some of those impulse-buy, fat quarter bundles sitting in your stash waiting for a project made just for them? This may be it! Check with your local quilt shop to see if they are expecting these new fabrics. And I'll see you next Wednesday here, right?